Belmont is located in picturesque Lafayette County, near Belmont Mound State Park. It is easy to see how Belmont came by its name, "Belle Monte," French for "beautiful hill." 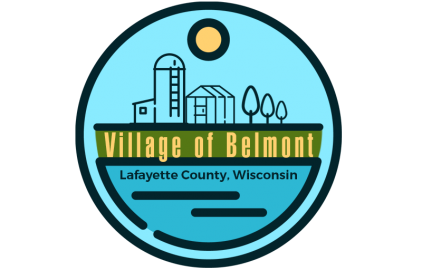 Belmont was the first capitol of the Wisconsin Territory. You can visit this historic site just north of Belmont. While driving there you can enjoy the beauty of Belmont Mound State Park. Belmont is a family friendly community. It is surrounded by rolling hills and scenic farms. Beautiful Bond, and Leahy Parks are in the village of Belmont. Belmont has a growing business community which includes two specialty cheese factories, a lumber yard, feed store, convention center and one of the area's largest greenhouse operations. It has a great, truck stop, RV dealership, family restaurant, mini mart, motel, and spa and salon just off of HWY 151. Drive into downtown Belmont to use the laundromat, or for more restaurant, tavern and pub choices. Fun is easy to find in Belmont. Each September Belmont hosts the state's oldest free fair, which originated in 1915. Recreation can be found year round at Belmont Mound State Park, Bond Park, Leahy Park, the Pecatonica State Trail, and Lake Joy. Belmont is located off of exit 26 on HWY 151. Belmont is an hour drive from Madison, WI. Belmont is a half hour drive from Dubuque, IA. Belmont is a three and a half hour drive from Chicago, IL.